With a clear brand as the foundation, your new website and speaker one-sheet can be crisp and clear, polished and professional, strategic and hardworking. Trust Patrice Rhoades-Baum and her team to clarify your brand, then create a powerful marketing toolkit that sets you apart and empowers you to promote and grow your business. 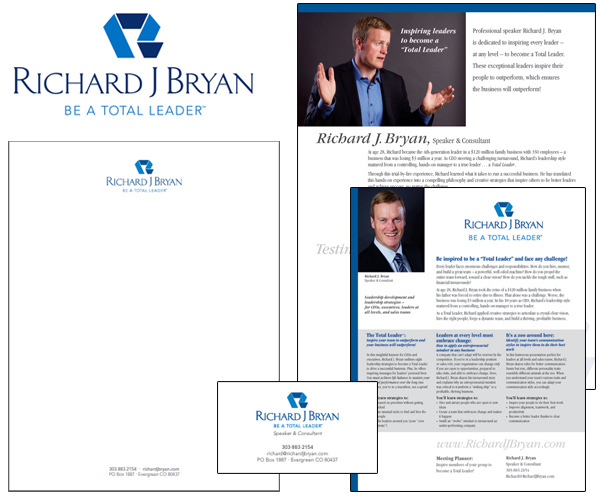 The following brief case studies showcase a variety of branding for solopreneurs projects. You’ll see how professional speakers, consultants, and business coaches were able to jump to the next level in their business. They shine as experts, and are poised to step up as thought leaders! Frances Rios was ready to leap onto her new career path: a full-time professional speaker who specializes in workforce communication. Frances and Patrice began by clarifying her new direction, business goals, target markets, key messages, and more. Located in Puerto Rico, Frances had the added requirement that her brand – both content and design – must work equally well in English and Spanish. Next, Patrice guided Frances through the logo design process; wrote the copy for her website, speaker one-sheet, and Home page video script; helped to select the best photos from her photoshoot, and offered input throughout the website design and development stages. 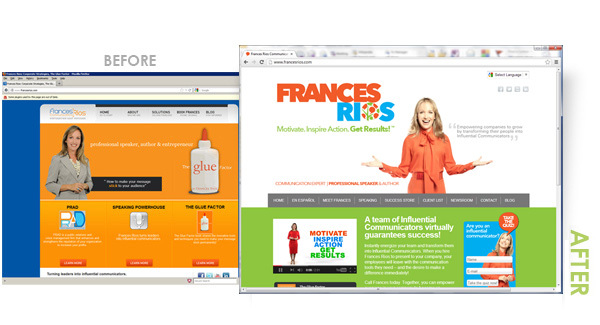 Armed with a clear brand and powerful benefit messages, Frances immediately began booking and presenting more speaking gigs throughout the Americas, even before her new website was live. Poised to leap, professional speaker John J. Hall had a goal, grasped it tight, and never let go. 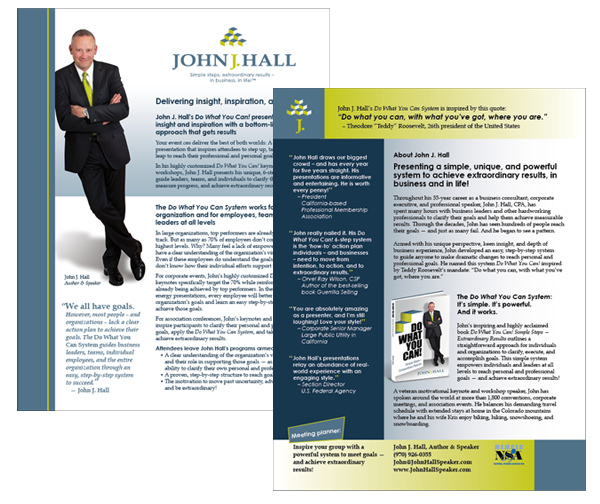 With unwavering perseverance – and while maintaining his “road-warrior” consulting and seminar business – John fulfilled his vision of writing and speaking on personal and business transformation. 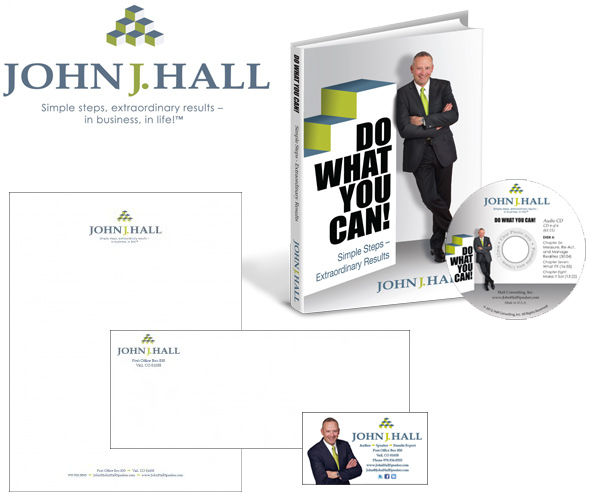 Today, John speaks around the world, presenting his “Do What You Can!” system, empowering readers and audience members to achieve extraordinary results in their business and personal lives. Postscript: John’s book was picked up by Balboa Press, a self-publishing division of Hay House. This gives him the opportunity to tap into Hay House’s marketing machine, with access to over 800,000 Hay House subscribers and 25,000 bookstores. Virtually every small business owner can benefit by gaining more objectivity, clarity, and focus on their brand. This was the case for Christie Ward, CSP. 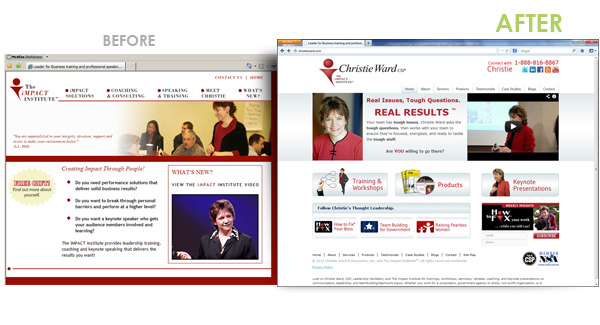 Christie has owned a thriving speaking and training business since 1999. Yet she needed just a bit of help connecting the dots for her brand. As Christie prepared for a complete website makeover, she realized she needed a tagline – a compelling promise statement that would “speak” to her prospective clients. She consulted with Patrice to clarify her brand. They started with a Deep Dive interview to discuss her target market, their needs, and her unique skills. In short, why clients rely on Christie Ward when grappling with team issues. At the end of their in-depth call, Patrice summarized the main points, and they spent time brainstorming key concepts and on-target phrases. After hanging up, Patrice took her dog for a walk, and Christie wrote a great tagline! In addition, Christie wrote this “challenge statement” (similar to a positioning statement), featured on her home page: Your team has tough issues. Christie Ward asks the tough questions, then works with your team to ensure they’re focused, energized, and ready to tackle the tough stuff. Are YOU willing to go there? They also addressed Christie’s other Brand Elements, including emphasizing her name (instead of her company name) to take advantage of her strong reputation. Because Christie prefers facilitating workshops and team meetings, they changed her title from Speaker to Leadership Facilitator. 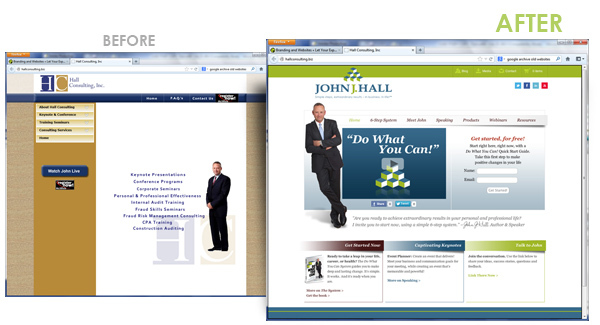 With a clear brand as the foundation, and final Brand Elements, the team was ready to move forward with the next steps. Patrice wrote the copy for Christie’s new website, which was designed and created by www.HereNextYear.com. Clarifying the brand for new speaking business uncovers a solid theme – and a surprising direction! Have you heard the phrase, peel the onion? When Richard J. Bryan hired Patrice to polish the brand for his new speaking business, he thought he had a clear and obvious path. He assumed he would speak to leaders of family-owned car dealerships, since he had led (and successfully sold) a family business in that industry. But there was a nagging issue: Richard wondered if this niche would offer rewarding speaking opportunities. Perhaps a broader target market – corporate leaders and business owners – would offer more opportunities and, simply put, be more energizing for him. Patrice thought, “Wow, we’re really onto something here!” She pressed Richard for details. What does it mean to be a total leader? What are the characteristics? Why is this important to the leader? To the employees? How does this support the business as a whole? By “peeling the onion,” Patrice and Richard identified a new, exciting brand for his speaking business, centered on the tagline: Be a Total Leader.™ After finalizing the “Nail Your Brand” document, Patrice and her team created Richard’s marketing toolkit: new logo, speaker one-sheet, and stationery package (business card and letterhead). Richard has launched his speaking and consulting business and frequently presents to business leaders in the U.S. and U.K. He has already published his first book, and his second book, Be a Total Leader, is forthcoming. Some people are a force. They find a way to succeed, even when their path is riddled with obstacles. Meet Julia Spencer. Due to an untreatable eye disease, Julia is experiencing severe and progressive vision loss. She is legally blind and relies on her Seeing Eye guide dog, Irene, for independence. An accomplished speaker during her corporate sales career, Julia launched her career as a professional keynoter immediately after publishing her memoir, Looking Through a Keyhole. 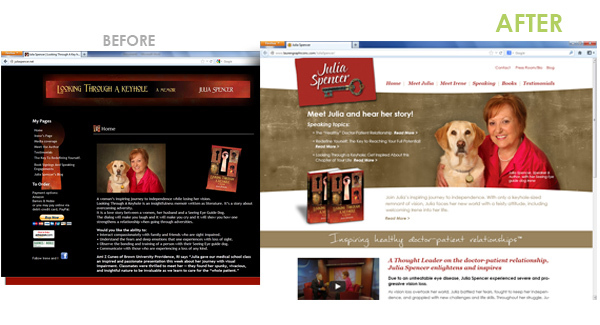 As her speaking business gained momentum, Julia recognized that her existing website and speaker one-sheet would not suffice, since they focused solely on promoting her book. In addition, she began speaking to medical schools about the doctor-patient relationship, and she wanted her new website and one-sheet to reflect this. During the branding discussions with Patrice, Julia revealed her strong desire to have a voice in the medical community regarding positive doctor-patient relationships. And she made a decision. She would step up as a thought leader. To reflect this in Julia’s brand, Patrice created this tagline: Inspiring healthy doctor-patient relationships™. After finalizing Julia’s new brand (the foundation for her marketing toolkit), Patrice and her team wrote, designed, and created Julia’s new website and speaker one-sheet. Armed with on-target marketing tools – and the drive – Julia is stepping up as a thought leader who makes a difference for both patients and doctors. As a small business owner, do you have a wide range of skills? Do you offer various services to different target markets? If so, how do you integrate the many facets of your business? How do you pull it all together under one umbrella? Unify everything into one brand? This was Paula Ruffy’s challenge. As a consultant and business coach, Paula was maintaining 2 websites with very different services, targeted to different types of clients (small business owners and corporate leaders). Plus, she needed guidance on how to discuss the powerful creating process she teaches, a supercharged process that yields astounding results. Paula was challenged by the fact that people would hear creative process instead of creating process – and immediately think about arts and crafts! Paula turned to Patrice to clarify her brand and write her website copy. 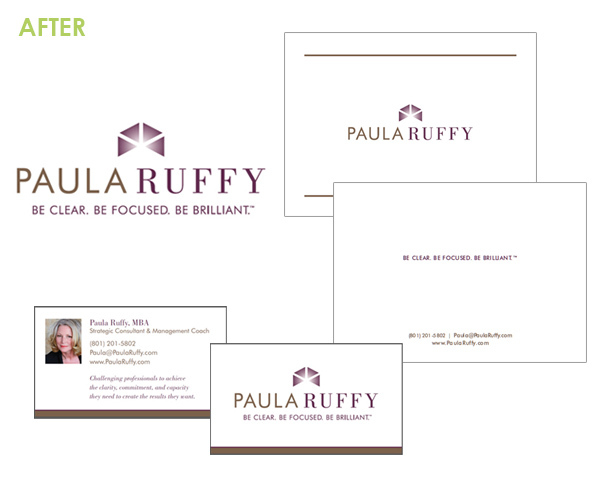 During their in-depth branding discussions, they discussed Paula’s disparate services and target markets, addressed the thorny communication issues, and identified the top benefits and results that every client receives when teaming with Paula. Challenging professionals to achieve the clarity, commitment, and capacity they need to create the results they want. 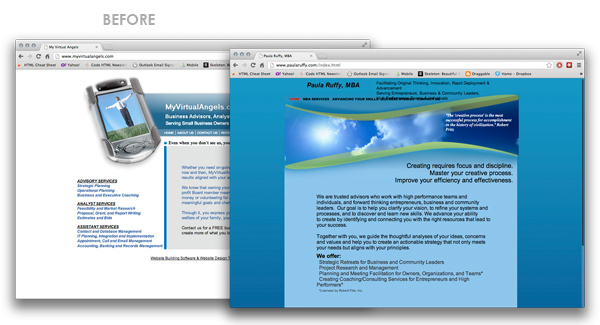 Next, they teamed with a talented designer to create Paula’s logo, and Patrice wrote the website copy. In this exciting, streamlined process, the team was able to clarify and unify Paula’s brand – with powerful messaging that “speak” to both target markets. Patrice had written the copy for Kathy’s old website about 7 years ago. To begin the new website project, they revisited points about Kathy’s service offerings, target markets, and the many benefits and results her clients receive. While writing the website copy, Patrice refined the top benefit message to be: “Armed with media skills training, you can control any interview. Master your message, and you master the media.” To add punch (and a bit of creative fun), Patrice sprinkled the messages “Don’t miss another PR opportunity” and “Opportunity’s knocking!” throughout the copy, including the call-to-action. In addition, Patrice and her team advised Kathy on the home-page video script, created the new website design, and developed the site. 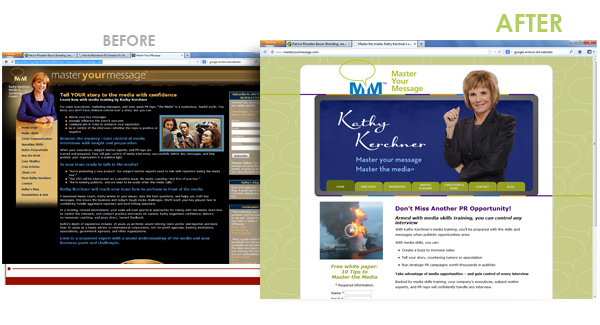 Today, Kathy’s new website features compelling, on-target copy; an active blog, video, social media links, and other contemporary features; and a bright, strong design. In short, it makes an impact! Suzanne Smith knew it would be a transformative year. She planned to move her Pilates studio when the lease ended but grappled with a big question: Should she move to a larger studio and hire a bevy of instructors – or move to a smaller studio and personally instruct all classes? Suzanne felt foggy about the direction to take her business. She needed clarity – fast! She hired Patrice to clarify her brand, write website copy, and lend guidance throughout the website design and development process. During their brand consulting discussions, Patrice quizzed Suzanne about her services, unique skills, target market, and the benefits and results clients receive – as well as her personal and business goals. What did Suzanne really want? 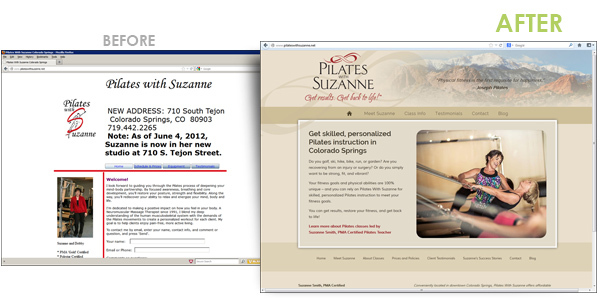 With honest introspection, Suzanne declared that she loves to personally teach every client. She did not want to hire instructors and step into an administrative role. A passionate and caring Pilates instructor, Suzanne thrives on guiding every client to achieve his or her optimal strength and flexibility – no matter the age or fitness level. 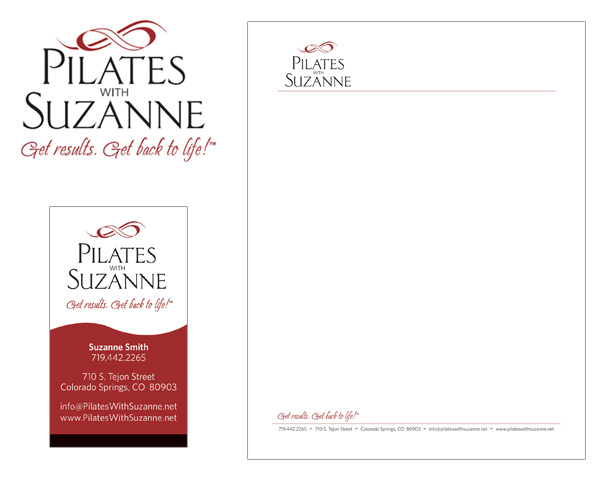 Based on these discussions, Patrice and Suzanne selected this tagline: “Get results. Get back to life!” Gaining clarity on the brand served as the foundation to create a new logo; new website copy, design, and photos; new business card and letterhead; and new ad campaigns.